Over 30 obstacles and 1,800 square metres to conquer! PLEASE NOTE: All bookings are MADE ONLINE. The Waiver is emailed to you after your booking is completed & you need to complete the Waiver BEFORE arrival to the park. If you don’t receive your Waiver email, or you’re a group and want to fill it out ahead of time, then you can use the Waiver button on this page. Discount Deals Available for Guests Staying Overnight – Please See Pricing. All tickets are for a 1 Hour Session (10 min safety talk and 50 min on Aqua Park). Buoyancy aid, shorty wetsuit and helmet included. Aqua Multi Pass x 5 – this is a great option for those who will be visiting more than once over the summer! After purchasing the “Aqua Multi Pass x 5” you will receive an email with your discount code. Each time you book a session online you will enter this code. It will be valid for 5 tickets (adult or child depending on the ticket type you purchased). This pass is for single use only (you can use one ticket per day). 1st Session Price = Standard Ticket (you can book this in advance online). 2nd Session Price: Adult €15 and Child €12 – You book this on site at the Lake House, sometime after you have checked-in. ALL Extra Sessions ONLY €10 – Again, you book all sessions (after your first session) on site at the Lake House. Please Note: The rates above apply to those families who book more than one Aqua Park session over the duration of their current overnight booking. Customers avail of this offer once they are on site . So when you arrive, you can head over to the Lake House to book extra sessions at the discounted rates!! Participants can arrive up to 1 hour before their activity start time, and they can stay for up to 1 hour after their activity finishes. Participants MUST be able to arrive 45 minutes before the session time. If you miss the safety talk, you will not be allowed on the aqua park and there is No Refund. Minimum of 1 adult to 6 children. Children aged 7-10 years must be accompanied by an adult (18+) on the Aqua Park (ratio 1 adult to 3 kids). Children aged 11-15 years must be accompanied by an adult (18+) on site. Supervising adults (those not going on the Aqua Park) do not have to pay in. The supervising adults can wait in the Lake House restaurant, out on the terrace or at the picnic areas around the Aqua Park. Children are the responsibility of the supervising adult at all times. Able to swim 50 metres with a buoyancy aid. Reasonably fit, you will be running, sliding, climbing and jumping on obstacles that are slippery and form an unstable platform. Confident in the water, you are likely to fall in and go under water. All sales are final. Customers can change dates/times with a minimum of 7 days notice, subject to availability and within the same calendar year. Complete the waiver that is emailed to you BEFORE you arrive to the park, or you will not be able to participate. If you did not receive your Waiver by email, then please use the Waiver button on this page. Bookings are bound by the Admittance Criteria and the Park’s Activity Terms & Conditions. Sessions are mixed age groups. The runways and obstacles of the course are all inflatable, anchored in place and floating on the water surface, and as such are all slippery and form an unstable platform. Wetsuits are provided and must be worn, or participants can bring their own. We have a large array of sizes. Participants MUST follow safety instructions at all ALL times, or they will be removed from the Aqua Park with NO Refund. Participants must be able to arrive 45 minutes before the session time. If you miss the safety talk, you will not be allowed on the aqua park and there is No Refund. Buoyancy aids must be worn at all times, and they cannot be taken off until back on shore. Please ensure your vest fits correctly and that the safety straps are tightened. NEVER under any circumstances swim under the obstacles. Always go over the top of the features. NEVER dive head first into the water. You must always enter the water feet first. Make sure the water area and landing are clear of people before jumping or sliding into the water. No pushing or rough play – Zero Tolerance policy and participants will be removed from the park immediately. Younger persons ARE ALWAYS given the right of way. The park is slippery and unstable, so take caution at all times. The park must NEVER be used under the influence of medication, drugs or alcohol. Participants will be removed from the park immediately if our team feels the need to do so. Our instructors will be out on the Aqua Park – you must listen to them at ALL times. They are also there to help you. Failure to abide by ANY of the RULES will result in participants being immediately removed from the Aqua Park to ensure the safety of all our guests. Participants should be AWARE of all safety rules and AGREE to use the Aqua Park entirely at their own risk and accepting 100% responsibility. All participants have to sign a Waiver. Please sign online before you arrive. Failure to do so may result in missing your session. No Refunds will be given to those who forget to sign the Waiver. ALL bookings are made online through our website. After you book, please complete the Waiver that is emailed to you. You will not be allowed to participate in the Aqua Park activity if your waiver has not been completed BEFORE your arrival to the park. Participants can arrive up to 1 hour before the activity start time and they can stay for up to 1 hour after the activity has finished (3 hours). You must arrive at least 45 minutes prior to the activity time. If you wish to stay for the day, then you need to book the Aqua Park + Day Pass Package (this package can be viewed from the booking system and more activities are included). Why is the arrival time 45 minutes prior to the activity? All participants need to allow time to check-in, obtain parking permit, park the car, organise themselves (use toilets etc). 20 minutes before your start time you will be brought down to the lower Aqua Park level where you will put your clothes, towels, shoes etc into provided baskets (your swimwear should already be on). You will be given a wetsuit, buoyancy aid and helmet (this requires time to get the right fit). A safety brief will be given before everyone swims out to the Aqua Park. What does the safety briefing entail? Participants will watch a safety video, and the instructors will ensure that all participants know the Aqua Park Rules – what to do and what not to do! Do I need to wear a helmet and buoyancy aid? On the Aqua Park everyone must wear a buoyancy aid and helmet at ALL times. Yes, shorty wetsuits are provided, or you can bring your own. If you are wearing one of our wetsuits, then you must wear swimwear under the wetsuit. Towel, swimwear (please have swimwear on under your clothes), prescription goggles if needed. You can wear your own wetsuit if you prefer. 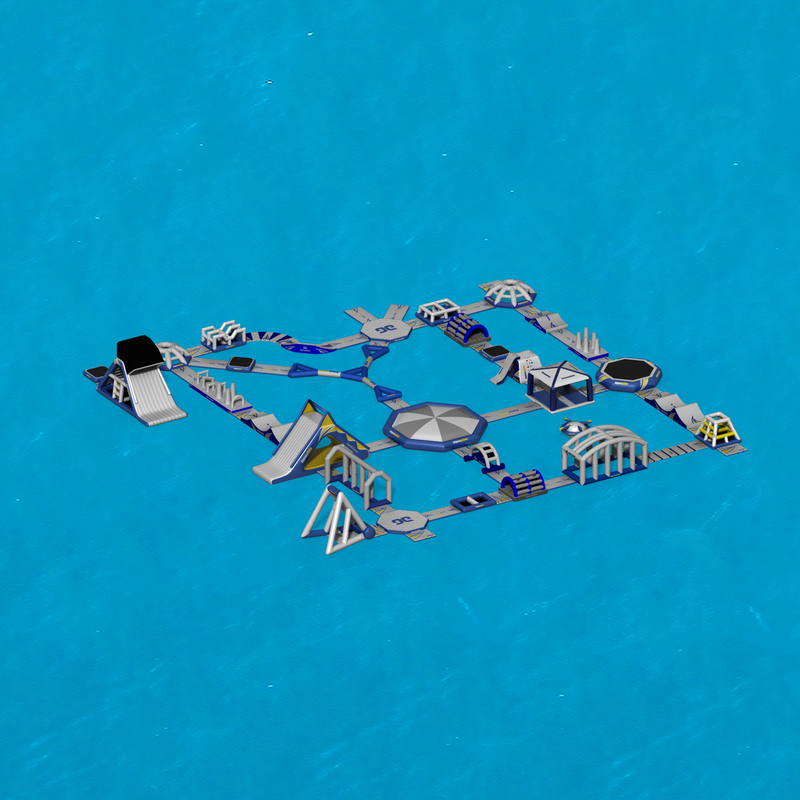 Where can I put my belongings while on the Aqua Park? Please leave all valuables at home, or in your car. We have baskets for you to store your clothes, shoes, towels etc. 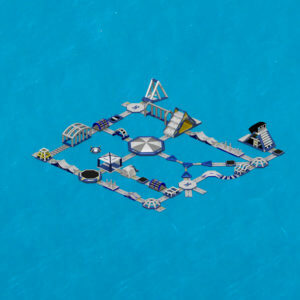 Can I wear jewellery/watch on the Aqua Park? No, all jewellery/watches/etc must be removed before you enter the park, including all removable earrings. If you have recently had a piercing, then this needs to be covered with tape. Can I wear my spectacles/glasses? No, you cannot wear your glasses on the Aqua Park. Prescription goggles are a good alternative. Can I take a waterproof camera or other electrical device onto the Aqua Park? No, we do not allow these devices out onto the Aqua Park. The minimum age is 7 years old, however the participant has to be taller than 1.1m. Participants need to be able to swim 50 metres with a buoyancy aid. All participants have to swim out to the Aqua Park. Yes, we have free parking on site. Can you go on the Aqua Park for longer than an hour? Yes, we offer single sessions or double sessions. Please note the aqua park is challenging, and not all participants will be able for a double session. There is a 10-minute break between sessions. Will I fall off the Aqua Park? Yes! The runways and obstacles of the course are all inflatable, anchored in place and floating on the water surface, and as such are all slippery and form an unstable platform. There are also slides, so you will get wet if you use these. 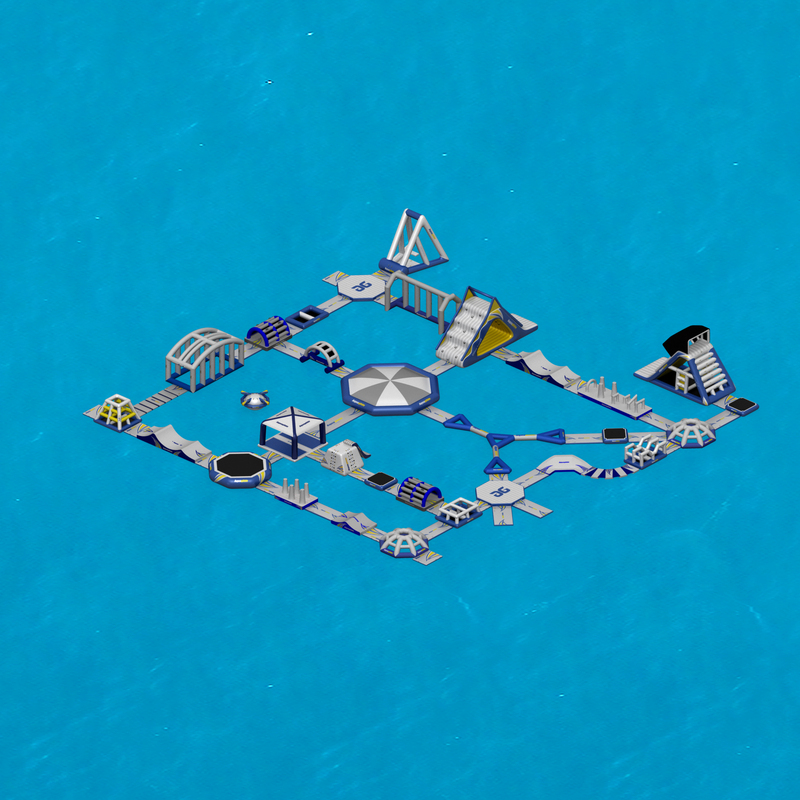 Does the Aqua Park have a less challenging area? Yes, the first circuit of the Aqua Park is less challenging, and therefore a great place for participants and younger kids to get comfortable and familiar with the activity. Is the Aqua Park dangerous? As with all activities, there is always an element of risk. All participants need to read the Terms & Conditions before booking. A waiver must also be completed before arrival. You will still take part in the rain as you will be getting wet anyways! If you are late and you miss the safety briefing, then you will not be allowed to go on the Aqua Park. No refund will be given and you will not be able to change times. Please don’t be late. Yes, we have hot showers for participants to rinse off afterward with changing cubicles just around the corner. However please note that the showers are outside and just for rinsing off before changing. If participants want to wash their hair etc, then they can leave the Aqua Park area and have a shower in the Lake House where there is a shower block for men and women. No, all sales are final. You can however change your date/time with 7 days notice, subject to availability and within the same calendar year. Are there discount deals for overnight guests at Hidden Valley? Yes, please see our Rates page where this information is displayed. The Aqua Park is still open in the rain, as you’re going to get wet anyways! If there is a dangerous storm and we have to close, then we will change your date/time or refund your booking. Are there fish in the lake? Yes, there could be fish in the lake as the lake is fed from the Avonmore River. Fantastic Activity for: School Tours, Scouts, Youth Groups, Corporate Outings, Birthday Parties, Family Reunions. Private Hire of the entire Aqua Park available for all types of groups.